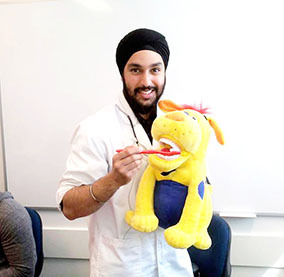 Dr. Belrup Singh Patrola was born and raised in Delta, British Columbia. He graduated from Griffith University in sunny Queensland Australia in 2015. Dr. Patrola graduated with high distinction and was elected President of the dental students association in 2013. Dr. Patrola was one of the most highly complemented Dentists during his time with Queensland Health because his passion to help and his kind and gentle natured demeanor is quiet evident when he practices dentistry. Dr. Patrola is passionate about cosmetic dentistry and is a licensed Invisalign provider along with licensed in dual drug sedation dentistry. He is also a valued member of the British Columbia Dental Association, the Canadian Dental Association and is in good standing with the College of Dental Surgeon of British Columbia.